Have you ever taken a look at a game and known, just known you were going to enjoy it? Well this week I had the pleasure of receiving an early copy of Eduardo Baraf’s GemPacked card game and as soon as I opened it up, I knew it was going to be fun. Update: We’ve been informed by designer Eduardo Baraf that since we wrote this review they’ve made a change to the rules that addresses the first player advantage in advanced play. 1st Player does not get the 2 extra pips, second gets 1 and then normal (2) from there. Also, in advance play make sure to rotate first player! This changes certain aspects of the review. I guess the best place to start would be the artwork. GP is cute and vibrant without being saccharine and in-your-face; everything just pops off the table and draws the eye even from a distance. There’s also been some clever graphic design thrown in as gameplay is very dependant on colours which would make GP tricky for colourblind peeps. However, each ‘colour’ of gem (known as Geminos) has been given it’s own character, differentiating each colour and making it a cinch to tell each apart. It’s a simple fix that speaks of well thought-out design for inclusiveness. On to gameplay. GP has three different sizes of Geminos: pips, squares and diamonds. These come in a mix of the three primary and three secondary colours. Each turn, players receive two random pips from a bag with which to buy square and diamond gems; these are on square cards set out in a grid on the table. Two pips will buy a square, two squares will buy a diamond. However, the colours of the pips and squares need to match the one you are trying to buy, so for example you’d need two red pips to buy a red square, but you could use a red and a yellow square to buy an orange diamond. At the end of the game squares are worth one victory point, whilst diamonds are worth 3 for secondary colours and 5 for the more difficult-to-buy primary colours. As an extra wrinkle, square cards can be ‘sold’ to generate pips that players can take from a common pip pool, in any combination that matches the sold square (selling a purple square could therefore give two purple pips or a red and a blue pip). This is where GemPacked gets really interesting as players wrack their brains to find the best way of combining and selling their pips and squares to maximise their score each round. It can however lead to a touch of AP which in larger player counts could be grating. However, I should probably stress here that GP is aimed at family gaming with a focus on being kid-friendly. Since kids are less likely to search for min-maxing opportunities, it would be less of an issue. If GP was just combining colours to upgrade to bigger versions of the same colour gem, it would feel unfocused as players just wait for their next turn and simply buy what they can. To counter this, GP comes with Goal cards which players can buy if they own the combination of pips, squares and diamonds printed. The Goals cards are worth victory points at the end of the game which is always two more than if you just kept hold of the gems instead. As mentioned this does give long-range focus to play and increases the strategies available to the players. The last twists in gameplay are the Action cards and the Sun/Nova/Red Dwarf cards. Action cards are dealt from the GemPacked cards deck when replacing Geminos that have been bought by players, and will either clear sections of the cards already dealt out or allow players to draw more pips from the bag. The Sun/Nova/Red Dwarf cards are additional cards with victory points that players can buy at any time with either pips or squares; these provide players with a way to sell odd combinations of colours that aren’t useful. The game ends when the pip bag is empty, at which point each player gets a last turn to buy what they can. Players then total up the victory points in their squares, diamonds, Goal cards and Sun/Nova/Red Dwarf cards. The play time is around 20 minutes making it ideal for a filler game, however with larger player counts the it can take quite a bit longer. With it’s simple ruleset and easy set up GP makes a cracking end-of-evening game to wind down with. 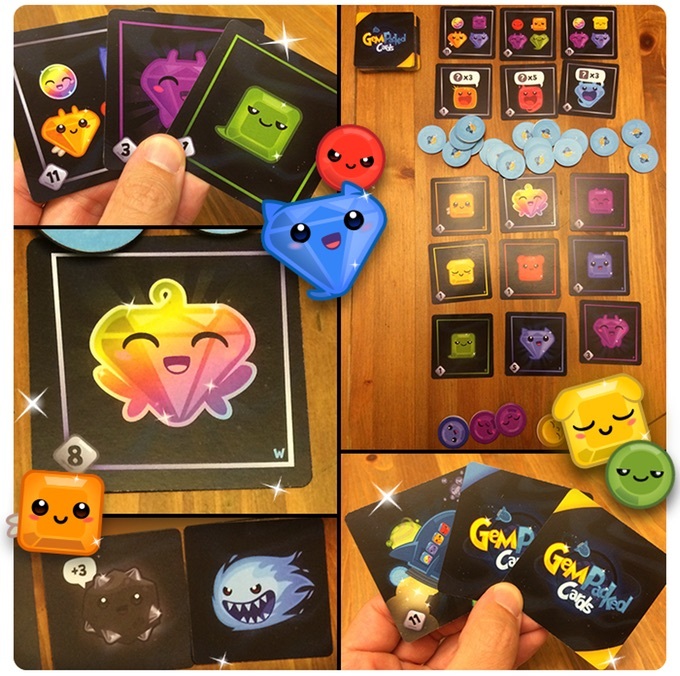 GemPacked is an amusing and punchy little game with a no-nonsense and largely intuitive ruleset that looks attractive on the table, just be aware that this is a game best suited for families or as a casual filler. If you fancy taking a look, check out the Kickstarter campaign; this is one I’ll certainly be backing! I just wanted to chuck in my 2 cents here additional to Bevan’s review. I’m with Bevan 100% (this is probably why we work together), the artwork is very well done, the graphic design is smart and functional and the overall feel and experience is exactly as you expect from looking at it, fun and bright and colourful. Regarding replayability, I put this in the same brain-box as similar sized/weighted game (stack-bots, for example). 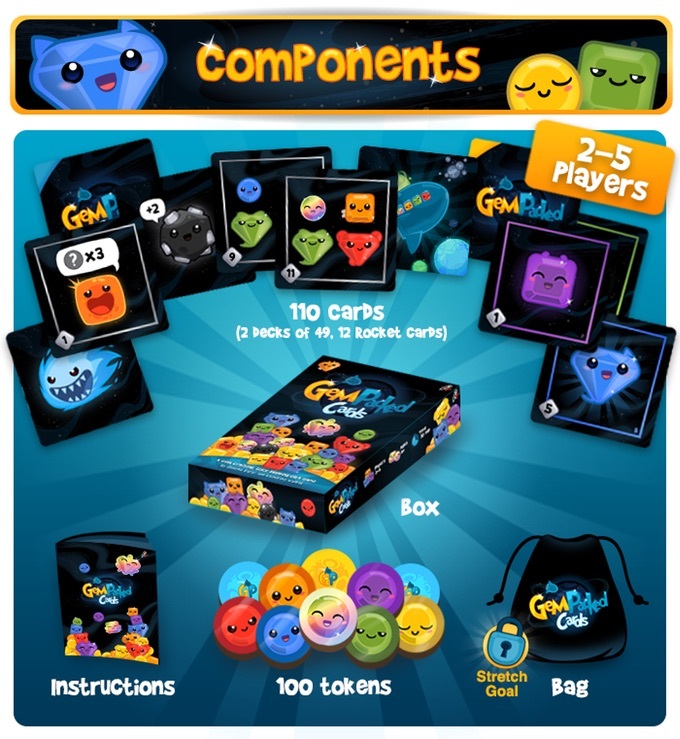 Good for families/younger players, and great as a filler too. Overall definitely something worth backing. Like Bevan said, if you’ve looked at it and thought you’re going to like it, you probably will.